Several hundred people enjoyed a beautiful evening on the lawn behind the Honan Library yesterday, as Harvard unlocked the gates around what will one day become "Library Park". Harvard President Drew Faust stopped by for a visit as did BRA Director John Palmieri. People seemed to spend most of their time outside eating the Harvard-provided food and visiting with neighbors. Some people went inside the tent where these posters showed examples of different park styles and different things that might happen at Library Park. Like at this Barry's Corner meeting hosted by Harvard in 2005, people could "vote" for different attributes by putting sticky dots on the posters. At the Barry's Corner meeting dots were rationed so each person could only vote a certain number of times, but last night there were sheets of dots lying on the table so anyone could vote as often as they wanted. There were also blank boards were people could hand write their comments. Hopefully three years from now Library Park will have progressed a lot further than Barry's Corner has since 2005. Some of these categories for voting were pretty vague (what does "neighborhood" mean?) but some clear preferences (like the small percentage of votes for a "formal" park) did emerge. You have another chance to get free food, learn more about this project, and comment or vote for what you'd like to see in this park at an ice cream social on Saturday afternoon from 1-3. There will probably be fewer "celebrities" but the posters and Harvard staff and consultants will be there and the wet weather forecast for Saturday suggests that you'll have the place more to yourself than last night's attendees did. The meeting on Tuesday of Allston/Brighton bicyclists was a great success. Arriving a few minutes late, I could tell it would be a good meeting because of the many bikes on the sidewalk in front of Smoken Joe's on Washington St. Inside I found 40 people filling the restaurant enthusiastic about making Allston and Brighton a better place for bicycling. There were some familiar faces like Alex Selvig and John Quatrale but many more people who I had never met or seen at a community meeting. City Hall was represented by Boston's "bike czar" Nicole Freedman and Aldo Ghirin from the Parks Department and there were people there from MassBike, the Allston/Brighton CDC, and other groups interested in improving our city and transportation in it. This was the group's first meeting so mostly it was a time to meet each other and volunteer to help the group in different ways. Thanks to Chris Ditunno for organizing the group. It will be great to have a group organized to support and encourage more bicycling here. 1047 Commonwealth Ave - Change the legal occupancy from office, storage, photo studio, travel agency to a trade school and one hundred and two dormitory rooms. Construct a three-story addition to existing building. John Connolly, who has been quite visible in Allston as an at-large City Councilor, is Chair of the City Council’s Committee on Environment and Health. John is holding a public hearing tomorrow on the risks posed by bisphenol A (BPA) to Boston residents. Bisphenol A is found in products including baby bottles, plastic water bottles, Tupperware, and in the lining of canned food goods. Recent studies have suggested reproductive, fetal, and infant health risks resulting from exposure to bisphenol A. Anyone who'd like to testify is welcome to. Dr. Michael Shannon, Chair of the Division of Emergency Medicine at the Children’s Hospital of Boston; Mia Davis of Clean Water Fund, co-author of Baby’s Toxic Bottle; and Steven Hentges, Ph.D., Executive Director of the American Chemistry Council’s Polycarbonate/BPA Global Group are expected to testify. When is a "non-profit" a non-profit? More about which organizations should be tax-exempt, what it means to be a non-profit, and the definition of a “purely public charity”. The article looks at the very big (Harvard, of course) and very small (Under the Rainbow Child Care Center). Kinds of activities that have been proposed: local advocacy (racks, signage, lanes); rides (community, mountain, road); resources (information about inexpensive helmets, legal counsel with expertise w/r/t bike accidents and legal issues; other resources that may be helpful to the Allston/Brighton bike community); education (of bike community, business community, drivers, local EMS, fire and police). Specific activities/issues/priorities of the group will be decided by those who participate. This new exhibit opens on Wednesday, May 28 with a reception from 6:30 - 8:30 PM. Mary Jane England, president of Regis College, will be the guest of honor. RSVP to 617-635-1436. There is a lot of talk about making our neighborhood more sustainable, reducing our impact on the environment, and encouraging more walking and bike riding. Consistent with those goals, it makes a lot of sense to add public water fountains where people can get a drink without buying expensive and wasteful bottled water. 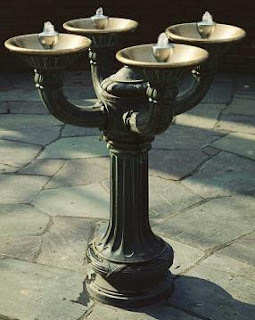 I have fond childhood memories of walks around Jamaica Pond and stopping at the large water fountain near the boathouse. The Benson Bubblers in Portland, Oregon (shown in the photo to the right) are another example of how this "street furniture" can be functional and attractive. Click the link to see the Genzyme plant and One Western Ave as seen from the Charles River. Almost 1 1/2 years ago, Harvard spent $16 million to purchase 176 Lincoln Street. The building still sits empty, and other than the rumor that Harvard might want to relocate the WBZ studios to this building, there is no suggestion that anything productive will happen in this building in the foreseeable future. 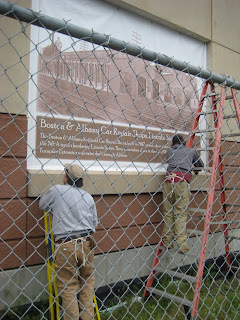 So my reaction is mixed to seeing Harvard installing large murals on the Everett Street side of the building. The images are nice and the historic factoids are interesting, but this project is sort of like the new trees and sidewalks on Western Ave. These modest improvements are improvements, but they don't address the larger and more fundamental problems that exist. The real problem with 176 Lincoln Street is that the building sits empty and adds to the neighborhood's ghost town feel. There is also the lousy looking "temporary" chain link fence along Everett St (that has been in place for years) and Everett St lacks a real sidewalk, bike lanes, and street trees, all of which makes the trip to and from the Stop & Shop or North Beacon St area less than pleasant. As they say, you can put lipstick on a pig, but it is still a pig. Lovers of the tender, chewy snacks served at Chinese dim sum - dumplings, buns, and daikon cake - have been raving about Gitlo's since it opened late last year. The Allston shop serves dim sum made to order day and night, and it's fantastic stuff. You'll leave thinking you could live on the shrimp dumplings ($3.25) - fat nuggets that stop just short of being too cute to eat. But you could also make room in your all-dim sum diet for the homemade stir-fried glass noodles and countless other items. Owner Shi Liu (a.k.a. Gitlo), a former cab driver, knew there'd be an audience for all-hours dim sum when he opened the shop with his cousin. As a cabbie, Liu could never get dim sum when he wanted it. He was right - if your dim sum cravings hit at inconvenient times, head to Allston. Next week the planning will begin for Library Park, a 1 acre public park to be built on Harvard property behind the Honan Library. Harvard has agreed to spend $3.5 million on construction of Library Park which is quite a chunk of change, so this could be one of the fanciest parks around. Harvard has also committed to spend $220,000 each year for 10 years on maintenance of the new park. That's an average of $4,230 every week! On Wednesday, May 28 from 5-7:30 Harvard is hosting a picnic at Library Park for all North Allston and North Brighton residents. At this event, Harvard President Drew Faust will make her first neighborhood appearance in Allston. Stephanie Hurley, a Doctor of Design Candidate at the Harvard Graduate School of Design, wrote recently about Harvard's expansion into Allston. She believes that Harvard should be a steward of the Charles River and care for it as "one of its valued icons and landscapes". "A Campus Centered on the Charles River"
Its pretty clear that the river where it passes through Allston and Brighton lacks a steward able to provide the maintenance that the river needs. The state will spend money to fix structurally deficient bridges elsewhere but there is no indication that the crumbling bridges here will be repaired any time soon. Repaving a path is nice but a small step towards what the river needs to be an attractive and well-maintained public resource. Japanese Sushi and Grille, 1245 Comm Ave - Request to extend hours of operation from 11:00P.M. to 2:00A.M. This story, about increasing commuter rail service between Worcester and Boston, says that "Harvard University is considering purchasing the 48-acre Allston rail yards, which have become less useful to CSX in recent years." Actually, Harvard spent $151 million to purchase these 48 acres from the Turnpike 8 years ago. Boston University Commencement 2008 means a lot of cars and people on the BU campus which will make driving on Comm Ave an exercise in patience. Geekhouse, a manufactrer of hand-built bicycles, at 15 West Sorrento St is one of the newest businesses in North Allston and they are having an open house and BBQ on Sunday afternoon at 2:00. 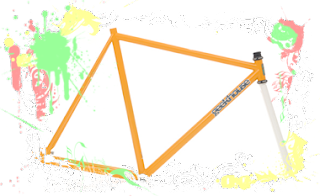 Stop by to learn how hand-made bikes are built and welcome our new neighbor. The BRA has published the Request for Proposals for the North Allston / North Brighton community wide plan that will be created this summer. The project will consider topics including open space, transportation, housing, retail, and economic development issues. A draft plan is expected to be published in November 2008 and a final plan in spring 2009. A "community version" of the RFP can be downloaded from the Files section of the ABNNF website. The complete RFP is available for review at the Honan Library reference desk. There is not much (if anything) of interest that is not in the electronic version. A community representative will be selected by the BRA to take part in the interviews of the consultants who apply for the job. The interviews will be during the day on June 18 (and June 19, if necessary). Contact Carlos Montanez (carlos.montanez.bra@cityofboston.gov, (617) 918-4442) if you are interested. I went to the opening of the Harvard spring ceramics sale at 175 N Harvard St this afternoon and highly recommend stopping by between now and Sunday. The variety of items is incredible - functional, whimsical, practical, humorous, useful, decorative - they have it all and at very reasonable prices. Harvard announced there will be a Farmers Market with 4 farms and 2 bakeries on Wednesdays from 3:00-7:00 in the parking lot at the intersection of North Harvard St and Western Ave. It will start on June 18 and run through October. Finale, a locally owned company specializing in desserts that also serves lunch and a light dinner, is exactly the sort of business that could fit in very well in Barry's Corner as part of a lively and interesting shopping and cultural district. Unfortunately, at their new Harvard-owned location at 9 Travis Street there is no opportunity to buy anything. Finale did not open a restaurant here, it moved it offices and commercial bakery to Allston. This would fit in well on Lincoln Street or other locations suited for "back street" businesses, but Barry's Corner is supposed to be Main Street, not Back Street. Fortunately, there is a small but sufficient space in the building that could one day be used for a small take-out storefront. Space between the building and sidewalk could fit a few small tables or benches. Also, Finale has generously donated desserts to local events and it does have Allston roots (the founder lived on Adamson St while attending Harvard Business School). With Harvard's adjacent ex-CITGO station and 7-11 properties and some creativity, this could eventually be the start of a vast improvement for Barry's Corner and the rest of the neighborhood. The Finale Dessert Co. holds a cake-cutting ceremony today for its new, 8,500-square-foot pastry kitchen and corporate headquarters on Travis Street in Allston. Finale, led by President Paul Conforti, will also announce the planned fall opening of a fifth location in Boston. This story in today's Globe makes special note of how differently Harvard is working with its Cambridge neighbors versus how it dealt with its Allston neighbors when it proposed an art building on Western Ave. In Allston, Harvard had trouble deciding what and where it wanted to build and why it was proposing these different plans. Harvard talked to the Globe before it talked to its neighbors and residents were not pleased. So its nice to see Harvard talking a different approach in Cambridge with the Fogg renovation and it would be nice to see development in Allston be done the same way. "This time around, Harvard is being careful. No glitzy press conferences or snazzy videos showing virtual tours - typical when museums announce building plans. Instead, Harvard Art Museum leaders have quietly held open houses and attended community meetings to make sure Cambridge residents approve of their latest multiyear project"
"Harvard is trying to make sure it shares information about the Quincy Street project with residents early, allowing them plenty of time to voice objections. Last month more than 600 neighbors were invited to a presentation and discussion at the Fogg"
""They've done a very very good job of informing the neighbors as to what is going on, and what the timeline is," said Joan Pickett, a member of the Mid-Cambridge Neighborhood Association. "Their outreach and their information have been very strong." Pickett said she considers the project "non-controversial." "They're keeping it within the scope of the neighborhood buildings, in terms of heights," she said. "They're not proposing anything controversial, as I think they were the last time. They're not proposing anything that really seems at this point to impinge on the character of the neighborhood. I haven't heard anything from any of the abutters that they're concerned, and that is usually a good sign." Mayor Menino will be at Portsmouth Park tomorrow from 9:30-10:30. Free food and plants, too. The new dean of Harvard’s Graduate School of Design Mohsen Mostafavi takes a serious interest in "urbanism" which he describes as "dealing with the city in its broadest sense... with the variety of issues that are connected with the urban condition." He also seems to have a social awareness that could have a positive influence on plans for Harvard's Allston expansion. "I think there's a great deal of fascination these days with more socially based, activist forms of practice. I think the students are more and more conscious of both the significance of signature architecture but at the same time, the potential alternatives to that form of practice. So, specifically, how can we be ethically responsible and also not sacrifice the commitment to design?" Speaking of urbanists, good things about Kairos Shen keep coming up. He only made a couple appearances last year during the review of the Science Complex but now he seems fully committed to the future of North Allston and North Brighton. One source of high praise for Kairos comes from Brent Toderian, the Director of Planning for the City of Vancouver. The planning and general urban excellence of Vancouver is widely recognized, so it is great to read Vancouver's planning director write about Kairos's "brilliant urban mind". For years Herb Goodman's Auto Sales has been in business at 242 Western Ave at the corner of Riverdale and Western in Allston. Herb still has many cars listed for sale on cars.com, but the Western Ave lot is now empty. The Registry of Deeds doesn't show any recent property transactions on Western Ave, but the situation seems a lot like what we saw when Harvard purchased the used car lot at 271 Western Ave in December 2006. UPDATE: Harvard did not purchase the property and there have been no recent transactions anywhere on Western Ave. It is still owned by the Harold Shoher Trust which also owns Stadium Auto Body and Stadium Gas at 280 Western Ave. If you have a bike and can make a bit of time free on Monday afternoon, please attend this event to show the importance of making Boston a better place to ride a bike. Boston Mayor Thomas Menino and Cambridge Mayor Denise Simmons will kick-off Bay State Bike Week with a short bike ride and speeches. Free T-shirts and/or water bottles provided to first 100 attendees. A strong show of support is critical to the success of the new Boston Bikes program. BU student Jeremy Savlen takes a look at the changing retail conditions on Brighton Ave, specifically 113 Brighton Ave where used book and record store Diskovery was located from 1983-2006. It is now home to L.A.B., a "blended space of art, lifestyle and community". Presentation School Foundation - 640 Washington St - Confirm the legal occupancy as a school and change the legal occupancy from a school to school, offices, education center, day care center, community center and adult education center, with parking. The Editorial Board of the Harvard Crimson, not unexpectedly, opposes the 2.5% tax on endowments being discussed in the State House. But if the proceeds of the tax were earmarked to support "appropriate" causes (whatever that means) then much of their objection seems to melt away. What they don't want is an endowment tax going into the State's general fund. The editorial starts by explaining what a terrible idea this tax would be because it might discourage contributions to the wealthy schools. So these two conflicting arguments don't really fit together - is any taxation of billion dollar endowments a bad idea, or is it a good idea so long as the money goes to help the homeless at the Pine Street Inn instead of pensions for former Big Dig managers? "Colleges and universities have missions that commit them to serve and better the community, callings that shouldn’t be reduced to assuage the problems the state government can’t handle. Perhaps this proposal would have been more amenable if the money taken by the state went directly to struggling non-profit organizations around the Commonwealth or other salutary areas." "Harvard, and its wealthy peer institutions should use some of the money that they have rightfully generated to give back to the communities that host them. There is nothing wrong, and much to be lauded, about donating some of their sizable endowments for philanthropic purposes." Brighton Ave closed at the intersection with Comm Ave.
A 2.5% tax on college endowments larger that $1 billion is being studied at the State House. This would bring $1.4 billion a year to the state, an increase of 5% for the state's current $28 billion budget. Harvard would be taxed $840 million on its $34 billion dollar endowment, a huge increase from the $1.8 million it currently pays Boston through the PILOT (Payment In Lieu Of Taxes) program. Boston College would pay $17 million, compared with its $260,000 PILOT payment. "The pileup of wealth doesn't match their mission of serving the public good," said Wick Sloane, who teaches at Bunker Hill Community College. "These schools have generated huge cash flows but are not doing their civic duty." The Friends of the Gardner Pilot Academy hosted a fantastic event last Friday at the Gardner Pilot Academy on Athol St. The kids enjoyed games and a talent show (shown in the photo) and the food, raffles, silent auction, and performances delighted all. Look for the next Friendship Feast in the fall. Chris Gordon, chief operating officer of the Allston Development Group, was at yesterday's Harvard Faculty of Arts and Sciences meeting with an update on Allston. "It is always our intention to be active listeners and to fully communicate." Doesn't most everyone know that the road to hell is paved with good intentions? Bartleby.com's explanation of this expression fits this situation quite well - "Merely intending to do good, without actually doing it, is of no value". Harvard's secret land purchases, telling the Boston Globe before the Allston community about major changes to its art warehouse proposal, refusal to work with the community to find suitable locations for the relocation of Charlesview or WBZ, or abandonment of the Harvard-owned ex-CITGO station and many other properties in Allston and Brighton, make it pretty clear what Harvard is doing in Allston and Brighton, regardless of what "intentions" the Harvard employees might profess to have. 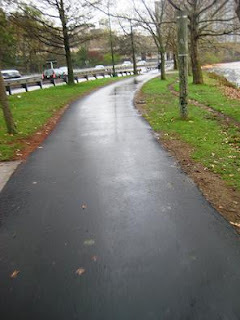 Over the weekend I took my first bike ride on the newly-improved bike path along the Charles River between the River St and BU bridges. 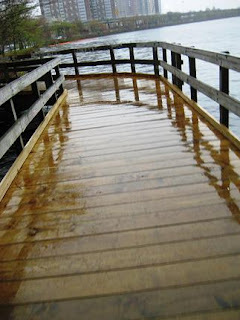 The new paving and boardwalk planks make for a MUCH nicer ride. Thank you DCR. Its none other than Harry Nesdekidis leading the Globe's B1 story about yesterday's Civic Summit. "This should have been done a long time ago," said Harry Nesdekidis, a 53-year-old mechanic from Brighton. "We need to get young people involved. We have to get people united in this city. Don't cry on the sidelines and expect things are going to change." Relevant to the recent exchange on the ABNNF email group about Shaw's and Brighton Mills is this NY Times op-ed classic from 1996 "It Drives Him Crazy" when gas cost $1.30 a gallon. Russell Baker write about cars, shopping, the price of gas, and more. Sure I'm mad about the price of gasoline, but what I'm really mad about is having to buy the stuff just to go to the grocery. I'm mad about the grocery having relocated from just around the corner to three miles away in what used to be a cornfield out in the country. And why? Because the grocer needs 15 acres of parking lot to accommodate cars that have to be driven three miles every time you want a bag of grapefruit and a gallon of milk. from the grocery carrying a bag of grapefruit and a gallon of milk, you ought to join a health club and get in shape." New England in Brief - The Boston Globe - Boston College fined $11,860 for failing to meet air quality and hazardous waste regulations at their gasoline dispensing facility. At the website of BC's Office of Environmental Health and Safety you can read about how "Boston College is committed to providing a safe and healthy campus environment. Among its highest priorities are the health and safety of all faculty, staff, and students, the visiting public, and members of the neighboring community." The Friends of the Gardner, a neighborhood group formed last year to support and improve the school, is hosting its semiannual fundraising event this afternoon from 4-7:30 at the school (corner of Athol and Brentwood Streets). There will be children's games, a raffle, music, great food, and much more. Please come to have fun, meet your neighbors, and support and important part of our neighborhood. Last weekend, the Friends planted new bushes along the Athol Street side of the school. Thank you to Mahoney's Garden Center on Western Ave for generously donating the plants. The BRA has published the Scoping Determination for the proposed relocation and expansion of Charlesview. Below are links to the document and some more information about it will be posted here soon.